Nebbiolo is one of my favourite grapes; hardly surprising when you think that it produces two of Italy’s most famous and prestigious wines - Barolo and Barbaresco. If you move further north in Piedmont you find the wines of Carema and Gattinara, however, if you move eastwards and into the Lombardy region, just along the border with Switzerland to the shores of Lake Como, you find the wine Valtellina. Produced from Nebbiolo, or as it’s locally known Chiavennasca, the Wine Makers are also allowed to blend in another local variety, Rossola Nera, with up to 20% for the DOC or 10% for the DOCG wines. However, restrictions on harvest yields, minimum levels of alcohol, and as the wines must also be aged for two years prior to being released, unless they are Riserva which necessitates three years, means it is far from a quick process in getting the Wine to meet these specific requirements. Within the region there are several villages who are considered higher quality; Grumello, Sassella, Inferno, Valgella and Maroggia- these are, of course, indicated on the label. They also produce an Amarone style DOCG wine called Sforzato. 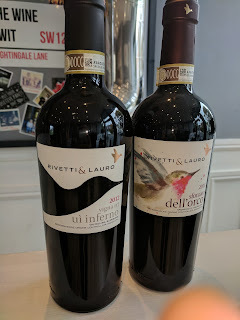 One of my favourite producers of these wines is Rivetti& Lauro. They produce several wines, including the really quite unique wine ‘Calis’, a white made from Pignola (another name for Nebbiolo) and Sauvignon. They also have wines from the villages of Sasella and Inferno, and produce the amazing Sforzato. The 2012 Inferno DOCG Valtellina is produced in small quantities; only 3,300 bottles, and is 100% Nebbiolo. Grape selection is done by hand and they are destemmed before being crushed and subsequently fermented in Stainless Steel tanks. After the fermentation process, the wine is aged for two years in French oak barrels. In the glass, the wine has a bright ruby red/purple colour to it, with pronounced aromas of Cherry, Vanilla and Clove. These come through on the palate beautifully and combines with the tannins and acidity perfectly. It drinks beautifully now and will continue to age and develop for the next ten years. The 2011 Sforzato DOCG Valtellina goes through a very similar process as the other Valtellina DOCG wines, however there is one big difference; the grapes are dried on big wooden racks for three/ four months before crushing, in a similar way to Amarone. The drying of the grapes first adds a real concentration to the wine, with aromas of red berry fruit, Tobacco and Truffle. On the palate, the fruit translates to significantly more wild berries with hints of Violets and Tobacco. Combine this with the fine but grippy tannins, and you have a remarkable wine that’s big, powerful and rich. These wines really are incredible. Although certainly a little harder to find, if you manage it I can assure you, you will not be disappointed. Copyright © 2019 The Wine Twit.